Following an independent, external audit, Aspirus Medevac is being awarded accreditation for their ground ambulance and rotor-wing medical transport program by the National Accreditation Alliance of Medical Transport Applications (NAAMTA). Aspirus Medevac provides exceptional transport services in North Central Wisconsin and Upper Michigan. Their willingness to provide 911 and ALS intercept services in rural areas demonstrates an exemplary commitment to meeting the medical transport needs of the communities they serve. NAAMTA Accreditation is founded upon standards, which identify best practice criteria in all aspects of medical transport, including business administration, personnel qualifications, training, communications, safety, etc. Utilizing a process of document review, on-site evaluations, and employee interviews, NAAMTA verified that Aspirus Medevac demonstrates compliance with each of the defined standards and incorporates best practice procedures. 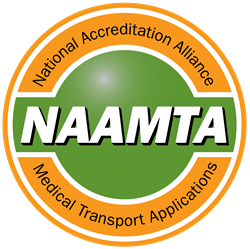 NAAMTA is an accreditation standard-bearer for the medical transport industry. The NAAMTA standards provide a firm foundation for application programs to develop a system focused on transport safety, patient care, quality management, and continuous improvement. NAAMTA is globally recognized for its ISO 9001:2015 QMS certification, and the implementation of quality practices throughout their accreditation program. NAAMTA’s certified quality management system is audited annually by PRI Registrar, an ANSI-ASQ National Accreditation Board-approved registrar, that certifies organizations to a variety of management systems including ISO 9001. Aspirus MedEvac medical transportation service provides 24-hour emergency air and ground medical transport for critically ill and injured individuals of North Central Wisconsin and Upper Michigan. Using a specially equipped helicopter operated by PHI, Aspirus Medevac provides both inter-facility transports, and emergency transports directly from the scene of an accident. Aspirus Medevac also operates critical care ground ambulances throughout their service area. In addition, Aspirus MedEvac provides ALS intercept for basic life support agencies or 911 coverage for select counties in the upper peninsula of Michigan. Aspirus Medevac is dedicated to providing the highest standard of care and safety to its patients.